Pre-drawn circle spoke diagram symbols like circular motion, circle, trapezoid ring, basic loop, block loop, arrow loop circle and more help create accurate diagrams and documentation. Edraw software has many circular charting shapes including circular motion, circle, trapezoid ring, basic loop, divergent circle, divergent blocks, highlight circle, variable radian, bevel style circle, circle pie, venn circle, etc. Circular motion can be described as movement of an object in a circular manner maintaining a uniform angle. With idea wheel shape, you can label each section of it and then write or draw your ideas in each section. Circle arrow loop for business concepts with icons, can be used for info-graphic, loop business report or plan, modern template, education template, business brochure and system diagram. Circle sector is the portion of a disk enclosed by two radii and an arc, where the smaller area is known as the minor sector and the larger being the major sector. Arrow circle is a circle of arrows moving in clockwise order. It can be used to display the development law of things. 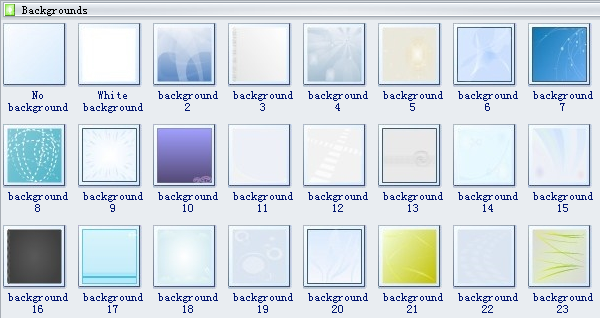 Beautiful backgrounds are provided in Edraw software to make your diagrams look more attractive. 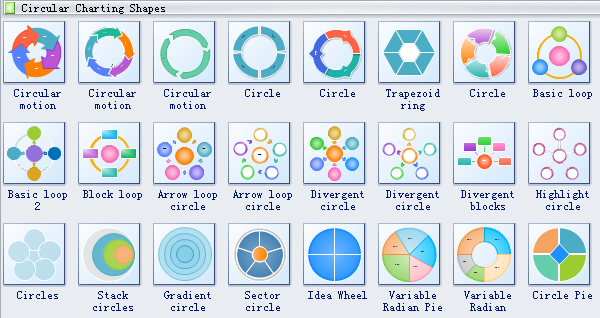 Need fresh looking circle spoke diagram symbols for your design? These circle spoke diagram symbols are a cinch to pop in. And their crisp, fine detail will make spectacular, easy-to-understand diagrams and presentations to your customers.